A file photo of a Short Brothers Tucano Mk 2 turboprop single-engine fighter trainer. It was the model that famed Hollywood composer James Horner was flying when he crashed while maneuvering at low level around rising terrain in Southern California in 2015. When a single-engine Short S312 Tucano disappeared from radar on June 22, 2015, it did so in more ways than one, even though the pilot who was killed happened to be a two-time Academy Award winner who was among filmdom’s most prolific and sought-after music composers, James Horner. He was 61 years old and was survived by his wife and two daughters. There were the initial news coverage and period of entertainment industry mourning, followed by what seemed to me to be a loss of interest in the accident except, perhaps, on the part of NTSB investigators, manufacturers of the aircraft and its components, and family members. It was a little over two years before the NTSB published its final report on what happened. For many members of the general public, and even some in the aviation community, at first glance this may have been a case of “nothing much to see here, just another case of a wealthy man going overboard in playing with an expensive toy.” But, as sometimes happens, the NTSB’s report exposed a couple of recurring traps that could be waiting to ensnare far more aviators than just those fortunate enough to fly something exotic. Horner was an aviation enthusiast and coupled that enthusiasm with his musical talents to write the score for a documentary about the P-51 Mustang as well as the score for National Geographic’s documentary “Living in the Age of Airplanes,” narrated by Harrison Ford. In all, Horner wrote more than 100 film scores, including those for the features “Titanic,” “Avatar,” “An American Tail,” “Apollo 13” and “Braveheart,” to name a few. He received an Oscar for the musical score of “Titanic” and, with co-writer Will Jennings, another Oscar for the song “My Heart Will Go On” from that same film. Horner was a private pilot and had airplane single-engine land and rotorcraft ratings. He did not have an instrument rating. His second-class medical certificate was issued a few days before the accident, on June 19, 2015. The medical certificate required him to wear corrective lenses. During the medical examination, he weighed in at 145 pounds and measured 5 feet 7 inches tall. He advised the FAA that he had high cholesterol and had been prescribed rosuvastatin and fenofibrate to treat it. He reported having accumulated 1,500 flight hours. His logbooks as reviewed by the NTSB showed 891.2 total flight hours. They showed 76.9 hours in S312 aircraft, of which 27.8 had been flown in the 6 months before the accident. His most recent flight review was on June 14, 2015, in the accident airplane. The accident occurred at about 9:30 in the morning. The airplane, a Short Brothers PLC S312 Tucano MK 1, went down about 16 miles south of Maricopa, California, in the Los Padres National Forest. The Ventura County Sheriff’s Department described it as a remote area near the border of Ventura and Santa Barbara counties. Horner was the only occupant. The crash touched off a fire that incinerated most of the airplane and consumed about two acres. The airplane had an FAA exhibition certificate in the experimental aircraft category. The Short Tucano was built under license by Short Brothers in Northern Ireland from Brazilian manufacturer Embraer, which had put out the EMB-312 Tucano. Short was supplying the trainer with two tandem seats to Britain’s Royal Air Force (RAF), the Kenya Air Force and Kuwait Air Force. The accident airplane was manufactured in 1989. It was registered with the FAA by Tucano Flyer LCC on August 23, 2013. The turboprop was powered by a Garrett (now Honeywell) TPE-331-12B-703A engine rated at 1,100 shaft horsepower turning a Hartzell 4-bladed propeller. A reduction drive was used to connect the engine to the propeller shaft. 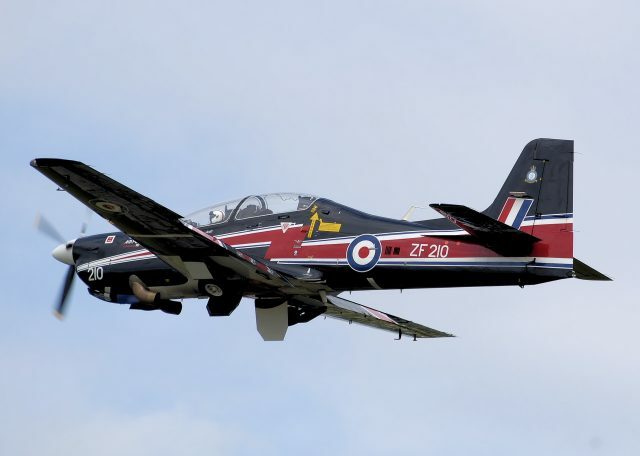 According to the RAF’s Aircraft and Operating Data Manual for Tucano trainers like this one, the airplane could be flown by one or two crew members. If being flown solo, the pilot sits in the front where there is full control of all systems. The manual shows that the airplane has a wing span of 37 feet, a length of 32 feet 4 inches, and a height with the landing gear extended of 11 feet 2 inches. It has electrically operated Fowler single-slotted flaps on each wing. The manual contains numerous charts for figuring out the aircraft’s takeoff, landing, climb and cruise performance at various altitudes in various configurations with various atmospheric conditions. One of the graphs for plotting cruise performance indicated that at about 10,000 feet, the expected cruise speed would have been around 275 knots true with an expected stall speed of about 82 knots. The accident airplane had 3,358 hours at its last annual inspection on October 20, 2014. Its certified maximum gross weight was 6,613 pounds. According to the NTSB, Horner took off from the Camarillo Airport (KCMA), Camarillo, California, at 8:10 a.m. It was a Part 91 personal flight in VFR conditions. The NTSB report did not specify whether he had received a weather briefing prior to departure. Published data for the S312 indicated that it can climb at 3,510 feet per minute, so it’s no surprise that when Horner checked in with the Sector 14 controller at the Los Angeles Air Route Traffic Control Center at 8:17, he was level at 9,500 feet. Horner asked for VFR flight following services and advised that he was going to be maneuvering in the general area and the nearest airport was the New Cuyama Airport, New Cuyama, California. The controller asked for details on what the pilot would be doing in the area, and he replied that it would be airwork and the altitude would be fluctuating between 10,000 feet and 2,500 feet. The controller said that at the lower altitude he’d probably lose radar contact, and Horner said he was aware of the terrain in the area. The controller then instructed him to contact another Los Angeles Center controller. Horner checked in with the Sector 15 controller and advised of the altitudes at which he’d be maneuvering. The controller told him that when he got below 7,000 feet, radio coverage likely would be lost as would radar coverage. Horner said that he understood but wanted to remain on a discrete transponder code so that the controller would know who he was. When the controller asked how long he expected to be maneuvering in the area, Horner said that it would be about an hour. The controller then told him he’d keep an eye out and asked if he’d be returning to Camarillo. Horner confirmed that he would be going back there. At about 8:25, a new controller took over the Sector 15 position and was briefed by the outgoing controller about Horner’s presence and intentions. At about 8:43, the controller made a radio call to Horner to advise him what he knew already, that he was in an area of high terrain and to verify that the pilot had the terrain in sight. Horner did not reply, so the controller repeated the transmission. Horner then reported the terrain in sight. The controller asked how much further south Horner was planning on flying, resulting in the pilot advising that he was planning to fly another 20 miles to the east, then turn. The controller asked if his destination was now New Cuyama, and Horner replied that it would be Camarillo. Horner was leaving Sector 15’s airspace, so the controller arranged a handoff to the Sector 13 controller. When Horner came up on the new frequency, he reported level at 8,500 feet. The Sector 13 controller gave him the altimeter setting, which Horner read back. About 12 minutes later, the controller asked for the pilot’s intentions, and Horner replied that he would be in the area for about 45 minutes and then head for Camarillo. At about 9:01, the controller advised Horner of a Cirrus headed to Fresno at 8,500 feet and about a mile or two northwest of his position. Horner said that he had the traffic. At about 9:21, the controller radioed the S312 to advise of unknown traffic at 11 o’clock and 4 miles, at 7,800 feet. There was no response. When the controller called again to report the traffic was now at 3 miles, Horner radioed that he’d be looking. About a minute later, the controller advised that the traffic was at 3 o’clock and 3 miles but should be no factor if the S312 was turning east. At about 9:24, Horner alerted the controller that he would be descending, the controller might lose him for a few minutes, and then he’d climb back up to 9,000 feet and return to the Camarillo airport. The controller acknowledged. At 9:29, the controller radioed to see if the S312 was still on frequency. There was no response. Within the next minute, the controller asked another airplane to try to raise the Tucano. There was no contact. The controller asked the other pilot to keep trying. The other pilot then reported seeing a small fire in what looked like a river bed. The controller asked the pilot of a Skywest flight to monitor for an emergency locator transmitter, but there was no ELT signal heard. The controller continued trying to raise the S312, asking the crew of a Gulfstream also to try. Nothing further was heard from Horner. An analysis of FAA radar data showed that early in the maneuvering, the airplane’s speed reached 325 knots and it sometimes came within 100 feet of the peak of a mountain ridge line. During the last 6 minutes of flight, it was maneuvering at about 1,600 feet above the ground. A witness living about 2-¾ miles from the crash site reported seeing the plane “...flying straight and normal, continuing to fly towards the east. I estimated the plane to be flying about 500-750 feet above the ground, and it appeared to be following the Quatal Canyon riverbed as it flew eastward.” This witness was a deputy with the Santa Barbara County Sheriff’s Department. He said that he received a phone call from his dispatch center advising there had been a plane crash in his area. They said another deputy was on the way and asked him to also respond to the scene. “I immediately recalled the plane I has observed a few minutes prior,” he said. He and the other deputy arrived on-scene at about the same time, immediately began securing the scene, and assisted the responding firefighters in putting out the fire. A witness about a mile closer to the crash site reported that the airplane circled her house at about 500 to 800 feet AGL and shortly after that she saw dust and smoke rise up into the air. The NTSB said the debris path was 641 feet long and 355 feet wide. The airplane was destroyed by the impact forces and the fire that broke out. The rear of the fuselage and tail section were partially intact. Investigators gathered numerous pieces of wreckage for detailed examination. No evidence was found of aircraft systems or engine problems before the crash. The engine had physical damage indicating it was operating during impact. The FAA’s Biological Sciences Research Laboratory in Oklahoma City, Oklahoma, performed toxicological testing on specimens from the pilot. Some alcohol was detected, but this could have been the result of bacterial action after the pilot’s death. What the Safety Board said was significant, however, was the detection of the drugs butalbital and codeine. A report by the NTSB’s chief medical officer said, in part, “Butalbital and codeine may be found in combination with acetaminophen or aspirin and caffeine in prescription medications intended to be used to treat headaches...Butalbital is a barbiturate medication available as a Schedule III controlled substance. Codeine is available as a Schedule II controlled substance.” The medical report said both are considered impairing medications that may affect the mental and/or physical abilities required for performing potentially hazardous tasks such as driving a car or operating machinery. It said that the level of the drugs was high enough to likely have impaired Horner’s performance during the high-workload flight.